STAMPlorations turns a year old this month and we're celebrating with a blog hop! We're also releasing the new stamps for July, so it's a double celebration. The other STAMPlorations girls and I are sharing projects we created that feature the new stamps. And we've got five talented card makers celebrating with us too! Visit all the stops on the hop and leave a comment for a chance to win stamps. 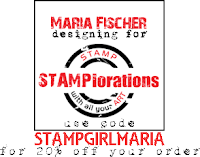 Shery's giving away over $120 worth of stamps! Take a gander at the graphic of all six new stamp sets up top. See the set on the far right? It's called VIGNETTE: It's your day. This is what I did with it. So here are the deets. 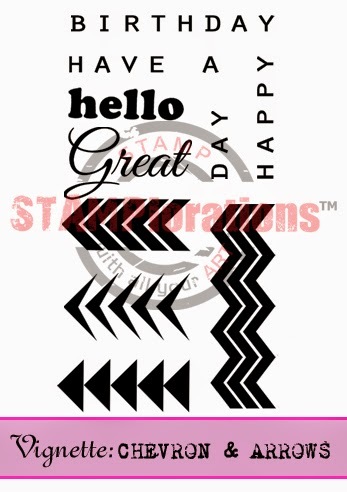 Fourteen (14) lucky hoppers randomly drawn from the designers' blogs will each win a stamp set - here on my blog you can win the VIGNETTE: Chevron and Arrows set which I personally love. 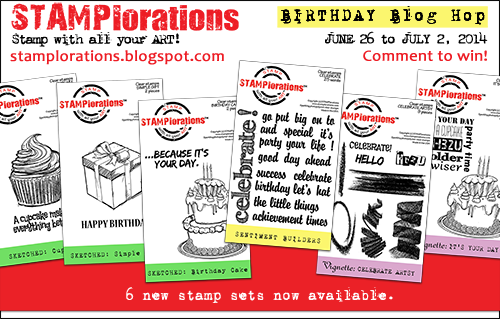 And one lucky hopper randomly drawn from the STAMPlorations blog will win ALL six stamps in the July release. You have until Wednesday, July 2, 11:55 p.m. PDT to comment here and on my fellow DTs' posts for your chance to win. Winners will be announced Sunday, July 6 on the STAMPlorations blog. BTW, if you love a good deal, Shery's got one going on for the new release. And starting July 7, I'll be doing another "Exploration STAMPlorations" series with the new release so do come back. I really like how you created the background, and also the colors you chose to do it! The colours on this one are great!!! I love the cupcake dual colour stamping. And the highlight is the blue sentiments stamped piece!!! Pretty card, love the colours. Thanks for the hop. I agree with other posts...The colors are wonderful! Cure card. The colours are amazing Maria, your background is the bomb! What super colours, I just love that background! Very different but love it. creative and a perfect celebratory birthday card. Love those colors too. Like those sentiments and colors! FABULOUS! Love the image with your sentiment and strings with sequins! I seldom think to use a large stamp for a background - the cupcakes are great for a celebration card. Thanks for the great idea! LOVE the stamped background with the dual colours. Great text too. Super fun birthday card! Lovely sets. That cupcake stamp is a must have. Would love to win and try them out! Like how you created the cupcake background. Love the cupcake set! Great card for a teen's birthday. Great job and love the colours. Stunning! Love the background stamping and colour combo - very cool! Cool and wonky background! Like those stringed up sequins! Great card. Lovin' the sequins and that fun wonky image! Fabulous card! I love that cake and what you did with it, so creative. I love how you showcased your sentiment too, just gorgeous. fun! happy birthday to stamplorations! Blue and green is always my favourite colour combo. Lovely card. Great card, I am so in love with the two tier cake, so much inspiration. What an original card! Love the colours and the tread! First: I am light years behind in commenting on your amazing cards, and I fully plan to catch up, so stay tuned. I'm parachuting in here to say you've worked magic with these stamps; eye-catching background (that wonky cake makes me smile!) and a charming sentiment cluster. Such a gorgeous showcase of the new release AND your creativity! Fabulous! This is gorgeous, I love the color you used for the background and that gold string with sequins is so amazing ! I loved the colors you used on the card! Awesome background and focal spot! I like the color combo of blue and green, and also using the cake for you background. I really love how you combine blue and green on the stamping background what a brilliant idea dear Maria..loveeee love this idea will try it one day ..and I have order to Sherry my first stamplorations stamp...love all her stamp all looks vintage and easy to use to each card occasion...your card is adorable Maria...you have a great idea...and Love this HOP too..
Great background!! I will definitely have to try that - it looks amazing! Very original and I love it! Super card!! Incredibly creative!! Love all the perfect details you added!! Great background for the sentiment. What a great card! I havent seen one quite like it before.. Thanks so much for sharing a great background idea with us all. Sally - ps.. love these new stamp sets! very cool - great way to show the versatility of the stamp! this is a pretty birthday card!!! Love it. Love this birthday card! Blue and green are one of my favorite combos and you have used the stamps beautifully!! What an interesting and usual card. I would not have thought of stringing sequins. Love the creativity of your card. Any Birthday Gal would love to get this! Great color combo! Fun card! Maria - I like the metallic thread and sequins idea - creative! Happy Birthday STAMPlorations! daughter. wife. mother. ex-financial analyst. english tutor. gardener. upcycler. cardmaker. expatriate. i live in rheinhessen wine country. and i hate lima beans and housework. Copyright © 2012-2018 by Maria Fischer. Simple theme. Powered by Blogger.